The third and final day of the $1,000 No-Limit Hold'em Event #33 of the 2014 World Series of Poker saw 10 players return to the ESPN feature stage. 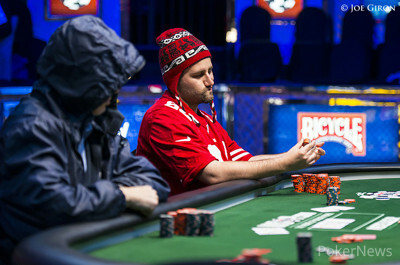 Will Givens was leading the field as only player with more than one million in chips. After less than seven levels and 154 hands of play, Dutch Boyd emerged victorious to win his third gold bracelet, adding to his victories in a $2,500 Short Handed No Limit Hold'em in 2006 and a $2,500 Limit Hold'em - Six Handed four years ago. David Olmsted missed out on the official final table after losing a coin-flip to Paul Cogliano. Half an hour later, Chad Dixon followed in ninth place after being unable to improve in a battle of the short stacks against Christopher Sensoli in Hand #5. The elimination of Gabriel Nassif in 8th place took place under spectacular circumstances after both the Frenchman and Vinny Pahuja hit a full house on a roller coaster board. Pahuja himself would be the next to hit the rail in seventh place after moving all in with and Boyd looked him up with in hand #41. Only two hands later, Sensoli called all in with only to see Cogliano connect with the board while holding . It was a crazy few minutes as yet another two hands later, Pok Kim also ran out of chips to finish in 5th place when her open-ended straight draw didn't improve against the trips of Givens. Start-of-the-day chip leader Givens bowed out 90 minutes later in hand #83 after previously losing a big pot to Cogliano. He got it in good against the very same opponent with versus but the appeared on the flop to send him off in fourth place. 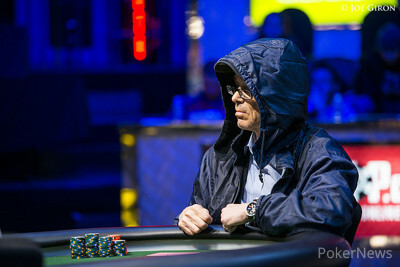 No further elimination took place until the dinner break and the very first hand back at the table, Cogliano three-bet shoved with . 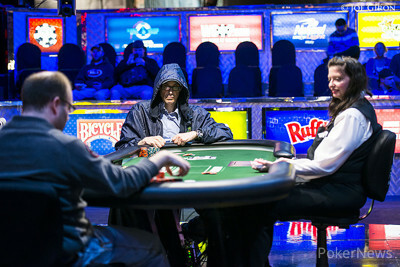 Boyd made the call with and held up to enter heads-up play as chip-leader. The heads-up battle itself was very one-sided and only lasted 16 hands. Steven Norden, who quadrupled his career earnings with the 2nd place finish, tried to bluff on the river with for king high. Boyd made the call with for top pair to let his rail erupt in cheer. The PokerNews live reporting of Event #33 concludes, but please make sure to tune back into the live updates when further champions will be crowned in the next few days and weeks as we are half-way through the 2014 World Series of Poker. 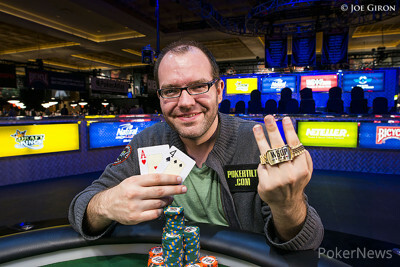 Dutch Boyd collects WSOP Gold Bracelet number three in event 33, a $1000 No-Limit Hold'em tournament. He bested a field of 1,688 players. Hand #153: Dutch Boyd raised to 120,000 and Steven Norden three-bet to 250,000. Boyd made the call. Both players checked and the dealer put out the turn card . Norden led out for 300,000 and Boyd made the call. The river was the and Norden moved all in. Boyd asked for a count and found it was 735,000. He took a few seconds to make sure he was happy with his decision and made the call. Boyd jumped out of his seat in wild celebration, the relief and joy spread all over his face as a disappointed Norden tossed his cards at the board. Hand #148: Steven Norden raised to 120,000 and Dutch Boyd called. 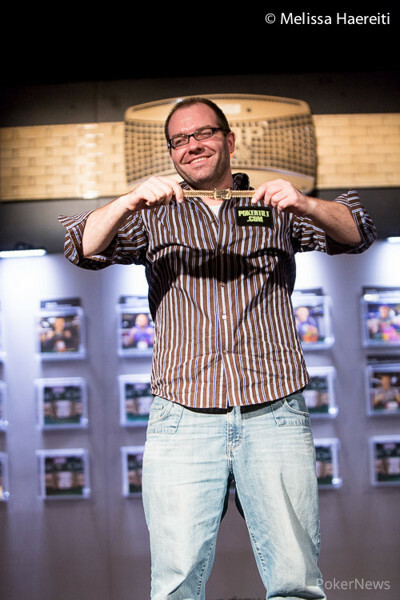 On the flop both players checked and Boyd won the hand with a bet of 120,000 after the appeared on the turn. Hand #149: Boyd mucked his cards and Norden received a walk. Hand #150: Norden limped from the small blind and Boyd checked his option. Both players checked the flop and the turn. Boyd then took it down with a bet of 60,000 on the river. Hand #151: Norden got another walk. 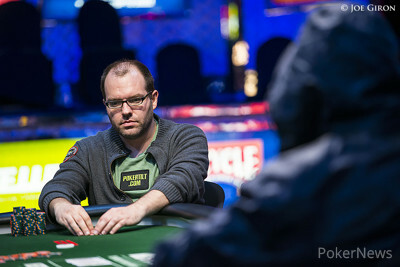 Hand #152: Norden mucked his cards preflop and Boyd received a walk. Hand #143: Dutch Boyd folded and Steven Norden got a walk. Hand #144: Norden raised to 145,000 and Boyd called. The flop was . They both checked and the turn was the . The duo checked again to the river. Boyd checked and Norden bet 145,000. Boyd folded. Hand #145: Boyd raised it to 120,000 and Norden folded. Hand #146: Norden opened for 120,000 and Boyd called. The flop was . Boyd checked and Norden bet 95,000. Boyd raised to 295,000 and Norden folded. Hand #147: Boyd opened for 120,000 and Norden called. The flop was . Norden checked and Boyd checked. The turn card was the and Norden bet 200,000, which Boyd called. The river was the . Norden checked and Boyd bet 200,000. Norden called. Boyd showed and won the pot. Hand #138: Heads-up play started with a raise from Steven Norden and he won the big blind. Hand #139: Dutch Boyd raised to 120,000 and got a call from Norden. On the flop, Norden check-folded when Boyd made it 120,000 to go. Hand #140: Boyd received a walk. Hand #141: Boyd made it 120,000 to go and Norden called. Both players saw the flop and Norden checked. Once again, Boyd took it down with a bet of 120,000. Hand #142: Boyd received the second walk in the first five hands; he also won all hands in heads-up so far. Hand #137: Dutch Boyd raised to 120,000 on the button. Steven Norden folded the small blind. Paul Cogliano in the big blind moved all in and Boyd asked for a count. “Wow,” he said before he called. Boyd was out of the seat as the flop was dealt hitting top pair, but giving Cogliano an open-ended straight draw. The turn came the and Boyd punched the air; just one more card to come. The river was the and Boyd let out a cry of celebration. Boyd had Cogliano covered and he hit the rail in third place.